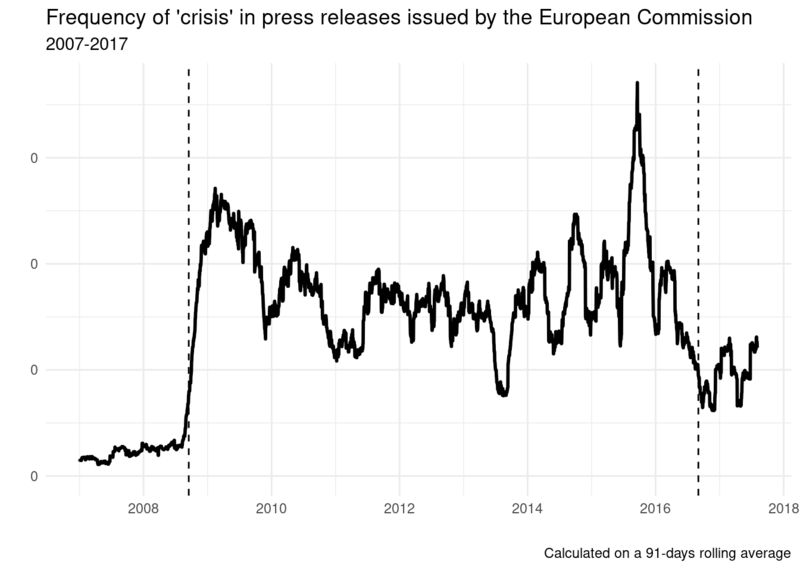 Zooming in on recent years, it appears clearly that the frequency of mentions to ‘crisis’ boomed starting with September 2008 and attenuated somewhat in the spring of 2016. The first dotted line in the graph below refers to 15 September 2008 (the day when Lehman Brothers filed for bankruptcy), the second is arbitrarily set at 1 September 2016, around the time when the frequency of mentions decreased substantially. It is worth mentioning, however, that even after this date, ‘crisis’ is still much more frequently mentioned than before 2008. 8 years of crisis - but what crisis? 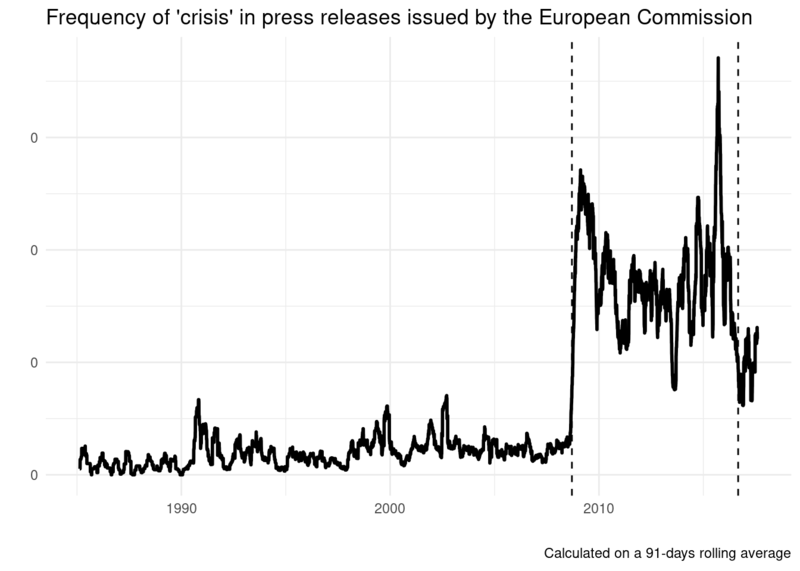 Here’s a list of all the types of crisis that have been mentioned in press releases issued by the European Commission at least 10 times since 1985. That’s a lot of different types of crisis. Some of them are by far the most frequently mentioned (e.g. ‘economic crisis’), others are now not any more of concern (‘BSE crisis’, related to the so called “mad cow” disease). Here’s a graph showing the most frequently mentioned types of crisis. 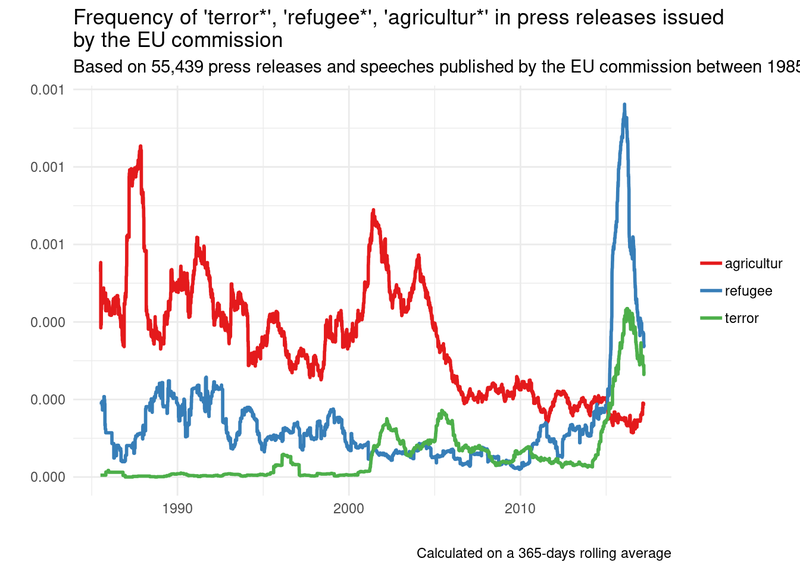 There’s good reason to believe that different crises were prominent at different times, and indeed, this appears clearly from the following graph based on the number of mentions per year of the most common types of crisis. Yes, but what was it all about? These are numbers, and obviously tell only part of the story. But if you are interested in what was actually being said about it… pick your crisis, and find out more by reading the original quotes. N.B. The first search box allows to search among types of crisis. The second search box on the right allows to filter by a second keyword within the results. This post was focused on crisis. But what else has the Commission been talking about through all these years? Well, agriculture, for example. And certainly not terrorism, which was barely even mentioned before 2001. If you’re curious about the frequency of other terms, you can test your hypotheses by inputting any term in the interactive graph available at this link. The source code of this post is available in full on GitHub. All of the contents of this blog, including graphs and code, are distributed under a Creative Commons license (BY). In brief, you can use and adapt all of the above as long you acknowledge the source: Giorgio Comai/OBC Transeuropa/#edjnet Feel free to embed the interactive graphs above in your own website or blog.